This home survived by following the tips below. Download a printable version of this list (111 Kb). Move your firewood pile out of your home's defensible space. 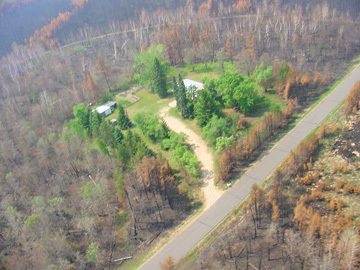 Perform a FIREWISE assessment of your home. Clean your roof and gutters of leaves and pine needles (best done in October). Clear the view of your house number so it can be easily seen from the street. Put a hose (at least 100' long) on a rack and attach it to an outside faucet. Trim all tree branches that overhang your house. Trim all tree branches from within 20' of all chimneys. Remove trees along the driveway to make it 12' wide. Prune branches overhanging the driveway to have 14' overhead clearance. Maintain a green lawn for 30' around your home. If new homes are still being built in your area, talk to the developer and local zoning officials about building standards. Plan and discuss an escape plan with your family. Have a practice drill. Include your pets. Get involved with your community's disaster mitigation plans. Check your fire extinguishers. Are they still charged? Are they easy to get to in an emergency? Does everyone in the family know where they are and how to use them? 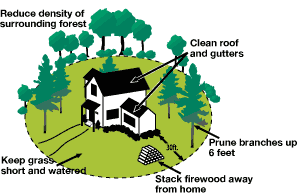 Clear deadwood and dense flammable vegetation from your home's defensible space. Remove evergreen shrubs from your home's defensible space, especially if your home is in a high-risk area. Review your homeowner's insurance policy for adequate coverage. Consult your insurance agent about costs of rebuilding and repairs in your area. Talk to your children about not starting fires or playing with matches. If you have a burn barrel that you use for burning trash , STOP! Compost leaves in the fall, don't burn them. Always have a shovel on hand and hook up the garden hose BEFORE you start the fire. Never burn if the smoke and flames are blowing toward your home (or your neighbor's home). Install highly visible house numbers (at least 4" tall) on your home. Install big, highly visible house numbers (at least 4" tall) at the entrance of the driveway onto the street. Use nonflammable materials and posts. Install metal screens on all attic, foundation, and other openings on your home to prevent accumulation of leaves and needles. Hold a neighborhood meeting to talk about fire safety. Invite your local fire chief. Have coffee and donuts for neighbors. Install a fire extinguisher in the kitchen AND the garage. Install a metal shield between your home and an attached wood fence. Replace evergreen shrubs with low-flammable plants in your home's defensible space. 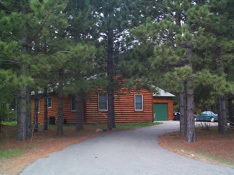 Thin and prune conifer trees for 30' to 100' around your home. Purchase and use a NOAA weather alert radio. Many types of emergencies are announced through this service. Replace vinyl gutters and downspouts with nonflammable metal gutters and downspouts. Install a spark arrestor or heavy wire screen with opening less than 1/2" on wood burning fireplaces and chimneys. Build a gravel turnaround area near your house big enough to allow a fire truck to turn around. Join your neighbors in having an additional access road into your neighborhood. Share the costs. Treat flammable materials like wood roofs, decks, and siding with fire- retardant chemicals. Modify driveway gates to accommodate fire trucks. They should be at least 10' wide and set back at least 30' from the road. If locked, use a key box approved by your local fire department or use a chain loop with the lock that can be cut in an emergency. Enclose decks to prevent accumulation of leaves, needles, and debris. Include a metal screen with a 1/8" mesh opening to prevent sparks from getting under the deck. Replace your roof with fire-resistant materials such as Class A shingles. Install a roof irrigation system to protect your home's roof. Install an independent water supply for a sprinkler system with a nonelectric (e.g., propane) powered pump capable of running unattended for 24 hours. Replace wood or vinyl siding with nonflammable material. Replace single-pane glass windows and plastic skylights with tempered, double-pane glass. Box in eaves, fascias, and soffits with aluminum or steel materials with metal screens to prevent entry of sparks. Improve driveway culverts and bridges to accommodate the weight of a fire truck. Relocate propane tanks inside the defensible space but at least 10' from the house. Have nonflammable ground cover such as gravel around them for 10'. Have electric service lines to your house placed underground. Improve your driveway by straightening sharp curves and filling in sharp dips that would hinder a fire truck.